Currently, BIME has two versions of a user. A studio user that can author new queries and dashboards and a named viewer who has access to view and interact with dashboards. Today, BIME is centralizing how you manage studio and named users to ensure your queries and dashboards get to the right people easily. This change comes from direct feedback we've heard from customers time and time again (so thank you to our customers!). Named users with the same email address as a studio user are merged into a single studio user. They will now use sign in credentials for the studio user. Studio users will no longer have to sign in as a named user to view the dashboard directly. All studio and named users are located in Admin > Manage dashboard viewer. Studio users are labeled with the 'Studio user' tag. The named user seats your studio users were using are now added back to your account, so you can give other users in your organization access to dashboards in BIME. This update was made June 5th, 2016. Can my studio users still view dashboards as named users? Your studio users can still view dashboards in the same window as named and end users. If you are the dashboard owner, you will need to ensure the studio user's group has permission to view the dashboard. Open the dashboard you would like your studio user to view as a named user. 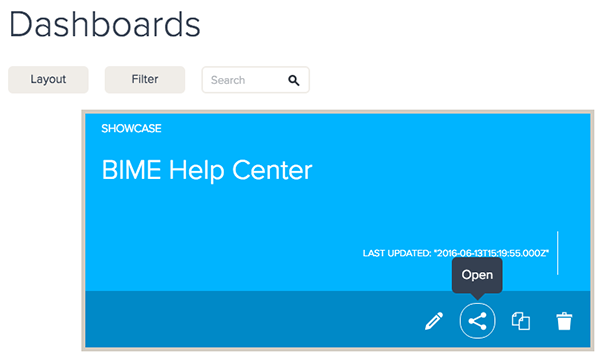 Share the dashboard with your studio user's named user group (see Publishing and sharing dashboards). In Admin( ) > Define fine grained authorizations on connections and dashboards( ) ensure that the Can view & edit box is checked for the shared dashboard. If this box is not checked, the dashboard will be removed from the studio user's Dashboard library. The studio user will then be able to click the Open( ) button at the bottom of the dashboard image in their Dashboard library. After they sign in again, they view the dashboard as a named user. You can find more information on studio and named users below.